My first time……….. Yes, I am about to disclose my first bike riding experience on RAGBRAI! The year…2000. 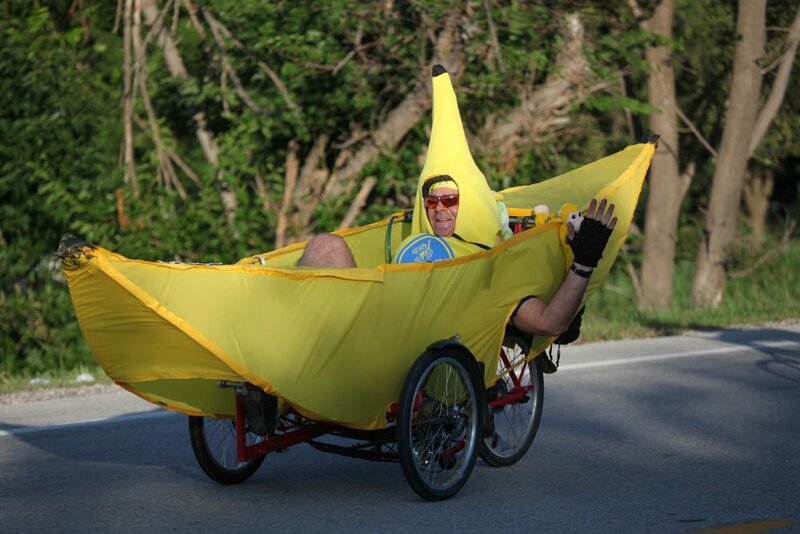 You see, I had heard of RAGBRAI. Everyone in Iowa hears about RAGBRAI. What I knew was people rode their bikes across the state in a week. I wasn’t a bike rider. Oh sure, we had a couple of bikes, a couple of good old Huffys! And I could have ridden around town, if I ever felt like it. Anyway, one of my best friends working at Kum and Go, Steve Murga rode RAGBRAI. I really didn’t pay much attention. 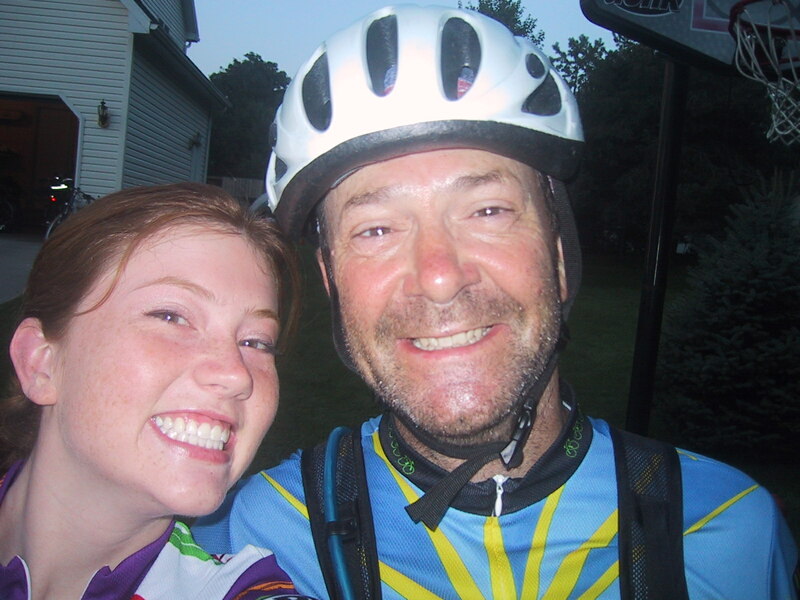 Steve would talk about RAGBRAI and how I needed to go. “NO!….I’m not wasting my vacation in Iowa to ride a bike. That’s stupid.” pretty much sums up my thoughts. 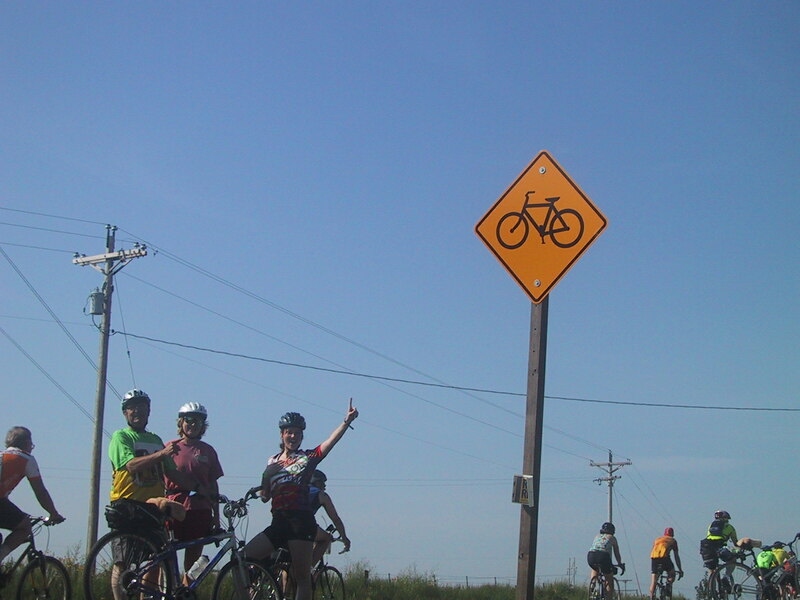 After a couple of years, we finally made a “deal” and part of the deal was that I would ride one day of RAGBRAI. Have I told you I’m a slow learner? Steve was full of good advice for my RAGBRAI experience. Like, “Mike, you need to get a bike. You don’t want to ride a Huffy all day” and “Mike, you will want to get in some training miles” and “You have to wear a helmet” YO Steve….A bike is a bike…right? And anyway, I’m in pretty good shape, we’re just going to ride a bike…gee… a helmet…really? Have I told you I’m a slow learner? In the middle of making so many bad decisions and not taking advice, I made one of the best decisions ever. I decided to ask Renae to spend the day riding with me. I didn’t know it, but one of the best ever father-daughter days was in the making. So with our Huffys, without training and with our 2 new Target $9.99 styrofoam -plastic covered helmets (one purple and one an awful green), Garnet drove Renae and I to Greenfield. We needed to be there and ready to ride with the team by 6am. We arrive and the team is milling around, not really hurried or excited like we were. We were READY! 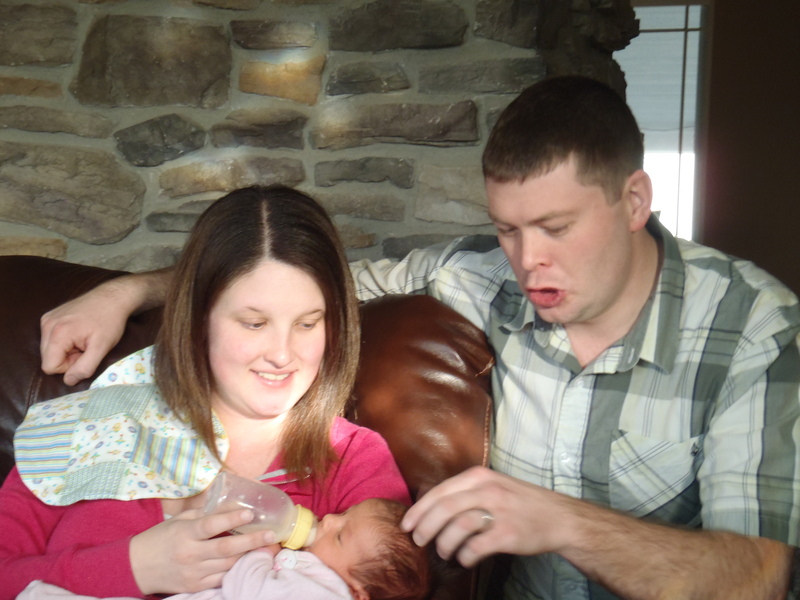 The team had camped in the back yard of a home and each member was going about their business of getting ready. I quickly discovered that the line to the restroom in the home was quite extensive. I decided to check out the neighborhood for a KYBO because we were close to a great deal of activity and where there are people there are KYBOs. Renae decided to go with me in search of relief also. We walked a couple of blocks and could see the backs of a long line of KYBOs …GREAT!. We walked around the end of the KYBO line and sure enough 2 people walk out and we both jump into our respective KYBOs! As I’m in there, I get a funny feeling. No not THAT feeling. You know, the feeling like something isn’t quite right with what just happened and perhaps a bazillion people are looking at you. So, as I exit, sure enough at the other end of the KYBO line is a massive (like bazillion) line of people waiting to use the KYBO. Well, ya can’t just have a do-over. So, we leave rather quickly going the direction we came from. Here is a good rule on RAGBRAI. If you want or need something, check for a line, cause most likely others want and need the same thing. Did I mention I’m a slow learner and not real observant at times? Renae and I make it back to camp and it is decided to ride the bus a few miles so the team isn’t so far behind. After that, it’s time to ride. We start out and it’s a beautiful day! Renae and I ride side by side and visit about anything and everything. It was amazing for me and so enjoyable. except…..it starts not being so easy…and we are about 3 miles into a 50 mile ride….hey this is starting to be WORK. And we are getting passed even on the downhills. Steve finally finds us and tells me it’s the Huffy’s fault. WHAT? can’t be. a bike is a bike? right? Steve wants to trade bikes with me because he has trained and can handle (my stupidity(my words)) the huffy. What a guy! I start out on his bike and Renae and I disappear. Fast…like it is the huffy’s fault. They didn’t find us for a couple of hours. I still didn’t believe in training. That learning curve would take a number of years to develop. But I found out the first year that I need something better than a Huffy or I needed to be Renae. Renae and I enjoyed the whole thing. People, food, country side and each other. But, I was really suffering, from what? (I found out later it is training and dehydration). I didn’t make it to Ankeny. When we got to Polk City, I quickly rode up to the bus, didn’t really stop, but rather threw the bike one way while I sprawled out sliding across the grass and stopping within a few feet of the team bus. That’s it! I’m DONE. Renae on the other hand decided to finish by riding a tandem with Steve Murga on into Ankeny. In Ankeny we found home made ice cream at the over night and I was so glad Garnet was there to give us a ride home. What a day!. Loved it and we have been back in some form each year since. 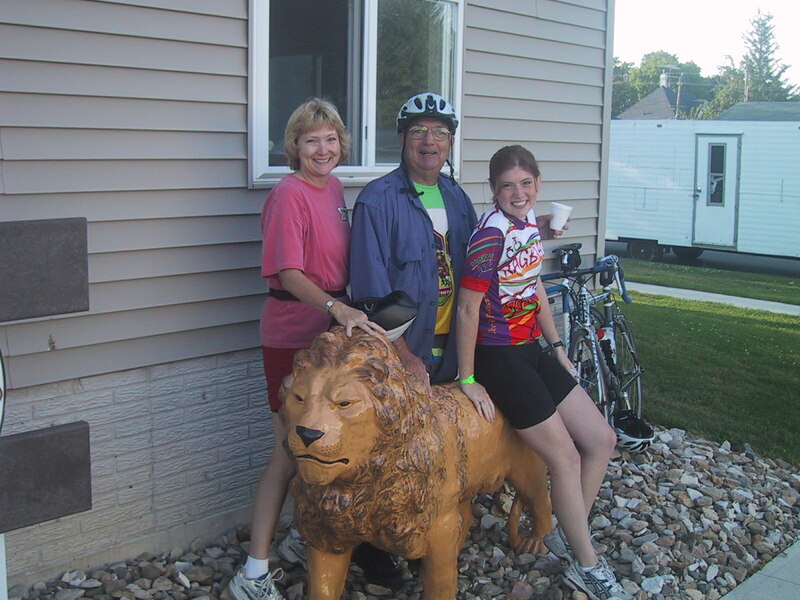 RAGBRAI – the hardest thing you’ll ever love to do. I grew up in Sugar Valley. We moved there in December of my 3rd grade of school. You may not find it on a map and probably can’t google it (now I’ll need to look). It was a magical place that doesn’t exist like it did then. Called Sugar Valley by the natives due to the abundance of sugar maples, it is basically the Des Moines River bottom between the Ledges State Park and Madrid Iowa. Growing up there was a wonderland that began by being able to look down from our kitchen window into the waters of the Des Moines River just a quarter of a mile away. And at times of flooding, the water would come within say 50 yards of our home. I grew up not knowing how special that world was. I thought Sugar Valley was common and that my friends grew up in the same manner. I will be sharing my Sugar Valley with you during a number of my posts. From digging for turtle eggs in the sandbar to not having phone service until I was a sophomore in high school to the abundant wildlife that existed, the stories are seemingly endless. My brother Chuck, being 3 years older, cleared the way for so many adventures. One of our first adventures would be during the summer after my 3rd grade. Chuck and I were going fishing. Had to be his idea. I didn’t know til years later that Mom did not approve and it was Dad that said “let the boys go”. So off the 2 of us went. 4th grader and 7th grader, really! To explore the banks of the Des Moines River… ALONE! With our poles and a can of worms, down across the pasture, through a marshy hillside over the pasture fence across the cornfield and to THE BANK. The mud bank came almost straight up out of the river some 10 feet below. Birds made holes, homes and nests in that bank…we would have fun with them later. There were spots along the bank where we could find our way down to the small ledge along the water. Tying a nut from Dads bolt bin onto the line and putting the worm on the hook, we would throw our lines in. Throw them as far upstream as we could and let the current bring them back to their resting spot. Then we would set the pole on the bank and run off to find things to do. We made bows and arrows from the willow trees and twine, but never poked an eye out. We would search for treasures along the adjacent sandbar. Bones from who knows what? But, BISON TEETH were a real find. Chuck may not admit it, but I caught the first fish ever from the river. Because, when we went back to retrieve our poles, a bullhead was on mine. It seemed as though we could spend all day outside and at the river. Swam across on a number of occasions. Jumped off trees that were sticking out of the current. I had no idea that only a few have these experiences. But, perhaps all our lives are like that. Each one of us have special upbringings. Things that only we go through that make us part of who we are. Until next time…..remember, be safe….wear your helmet! The ride starts at 10am…I think. We like to try to start with the official start just because of the number of people. We like the more the merrier theory. But, you can start at anytime and finish at anytime. Riding at night is not recommended, so stops in Rippey have been shut down at times that force riders to return to Perry while there is still light. We have finished in the early afternoon, but we have heard that Perry stays a buzz thru the evening if you pace yourself properly. Proper attire is the key. We have ridden when the wind chill was 30 below and we have see 50 degrees. Look at the forecast. Remember that 10am seems to be a COLD part of the day. While riding, you create your own wind chill and heat. We layer as much as possible with the plan of opening up or removing some. Take a backpack or bungee cords. I start with pretty much a base layer. Under Armour top and I have some Cannondale Carabou riding pants that are like scuba gear. More isn’t always better. Loose fitting 2nd layer is good because it allows warmth in between. I’ll then wear some bib ski pants. Perhaps another layer of a jersey or fleece upper if it is extreme cold. And then a good heavy outer jacket. I seem to warm up quicker than Garnet. Within a mile or 2 I’ll be zipping my parka open to get some cooler air on my upper body. The most critical for me are my hands, feet and face. For my hands, I have a pair of light weight Nike gloves, then (depending on the temp) I may use another pair of over sized gloves and even some mittens. I may only need the Nike gloves, but having extra is OK as long as it isn’t too tight and the layers allow flexibility. My feet seem to always get cold. I have used snow boots. Wool socks with batteries. Bike shoes with snow boot felt liners over them. Plastic bags between the layers and those heat packs that are available. Nothing works really great for me. BUT, out of all of that, I will always use the plastic bags (bread sacks) in my basket of tricks. they break the wind and hold heat in. Again, don’t have too much that air isn’t part of your insulation. Tight ANYTHING isn’t good. This year, I may use warm socks, bread sacks and a pair of snow Pack boots. Now….my face! We have used scarves, ski masks, “gator” face masks, and found a Balaclava works best for us. I didn’t know what one was and I still don’t know how to say it. But it is warm and nice. Balaclava! And don’t forget your eyes. We try sun glasses and different goggles. It is so hard because they will fog over in a flash (just breathing) and will worsen with breathing HARD. Which I do. This year I may try a Santa hat and beard combo with some new goggles. The key is to be lightly covered. Last, but most near and dear to me. Whatever your choices, please do not take away from the safety of your helmet. Make sure it still fits well and provides the protection we each need. Brr is 25 miles. We believe it is closer to a 50 mile ride because of the conditions. Plan accordingly, have fun at the stops available. Rippey has a number of places to enjoy. Perry has a number of places and activities throughout the day and night. We like to go early and stay late. Make sure your bike is ready. We forgot to take into consideration that our bike would have extreme wind chill during the drive to Perry. It worked fine in the garage and when we got there we were frozen. Make sure your chain and cables are properly lubed. We have frozen up and had to quit. We have ridden one direction because of the wind and wind chill. We have been too bundled up and couldn’t ride. We have broken parts and limped home. And WE HAVE ENJOYED it every time. It’s not the ride, it’s the adventure. You can do it…or part of it….but ya gotta wanta have fun…..
Good morning and happy new year. Here it is. The start of another year. A time to look back and reflect and look ahead to the future. We all want to believe we are in control of our lives. And then wonder what happened. I’m glad that God allows us to grow. I believe we are the lump sum of decisions we make. Good or bad. I remember telling Brodie and Renae as they were growing up that they would have opportunities to make decisions, please make as many good ones as possible because even some you think are good will be bad. You shouldn’t start with ones you know are bad. So, I think this year I will take my advice and see how many good decisions I can make. I will find a worthy passion and pursue it. We should all find a time in our lives when we try to make a difference in the world and to others instead of ourselves. I know many people figure this out early in life, but I’m a slow learner and it’s time for me to do so. This, in a way, is the beginning of something new. Just like the year, it starts today.